In a previous Flavours blog post, we mentioned all about the Venice Carnival, its beginnings and traditions. You might be surprised to know, it’s not the only carnival to take place in Italy. Across the country, leading up to Mardi Gras, there are several different carnivals each with their own quirks and traditions. Situated in the northern region of Piemonte, the historic carnival of Ivrea re-enacts and celebrates the town’s liberation from tyranny. Legend has it when an evil baron starved the city of food, a miller’s daughter led a rebellion against the baron, cutting off his head and incited the people to revolt and destroy the baron’s castle. 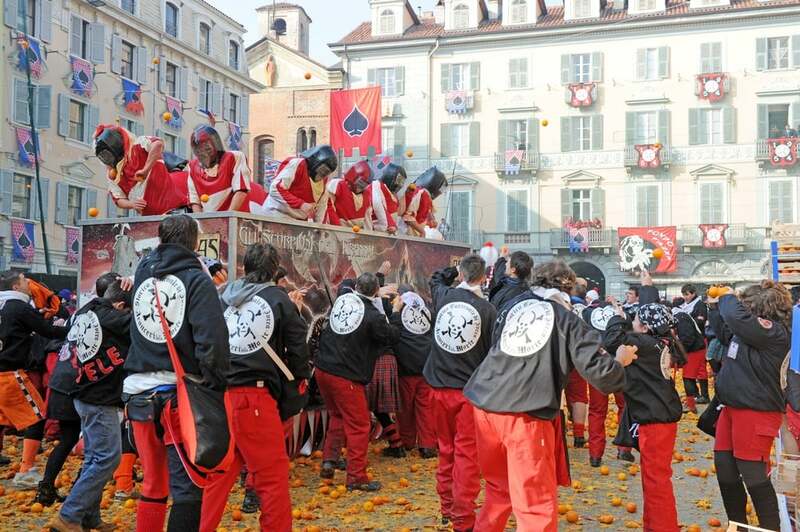 A host of historic figures from this local uprising make an appearance during the carnival but the most iconic and spectacular event from the carnival is The Battle of Oranges (Battaglia delle Arance.) The Battle of Oranges re-enacts the people’s revolt against the baron. Nine teams represent the masses while those on horseback and carts during the orange fight represent the baron’s army. The Tuscan coastal town of Viareggio, known for its Art Deco architecture comes alive during carnival. It’s a feast for the eyes with its colourful pageantry and famous paper mache characters. The Mardi Gras parade is a spectacle televised on Italian TV every year. A triple cannon shot from the sea announces the beginning of each carnival parade and so begins the energetic and colourful walk along the Lungomare. 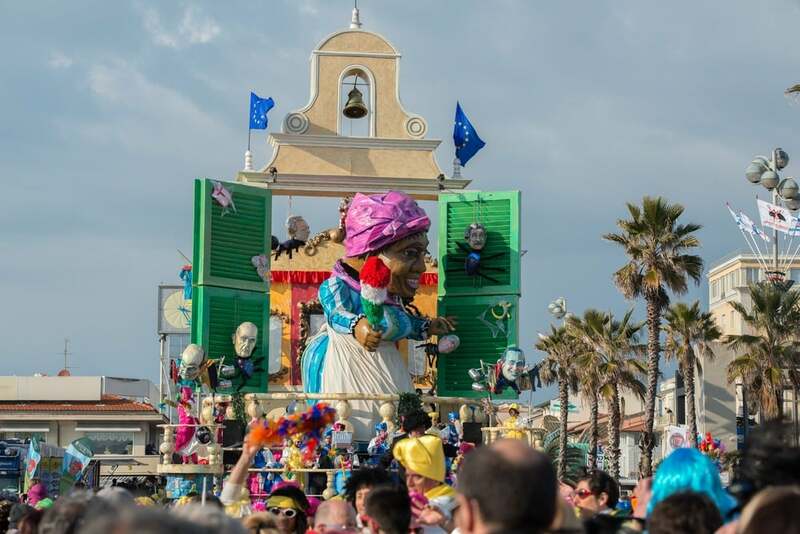 Over a million people flock to Viareggio to take in one their spectacular parades. Saint Agatha is the patron saint of the Sicilian city of Catania and home to one of the world’s largest religious processions. The event begins with a dawn mass after which a statue of St. Agatha is placed upon an extremely heavy silver carriage and pulled up the Monte San Giuliano by 5,000 men. The 2-day event celebrates the life of Saint Agatha who died aged 15 in the 2nd century AD. As with most Italian festivals, there is much food and drink to be consumed and the end of the festival is celebrated with a firework display. At Flavours we offer holidays to Tuscany and Sicily, both mentioned above. Find out more about Flavours Holidays here.